National Chocolate Cake Day is almost upon us, and now sounds like a good time for me to implore you to please celebrate this most wonderful of holidays with a chocolate cake. Go ahead and treat yourself to what I consider one of the best cakes that can ever be made. Of course, as with most things, not every chocolate cake is born equal. Some just stand out from the crowd, and it’s my job to point you toward recipes you ought to be embracing, and it’s your job to embrace them! So, without further ado, on to the chocolate cakes. Believe it or not, there are actually many different types of chocolate cakes. Chocolate blackout cakes, chocolate gateaux, molten lava chocolate cakes, flourless chocolate cakes, black forest cakes, chocolate mousse cake, German chocolate cake, chocolate Bavarian, and so many more. It can be incredibly hard to pick just one. Of course, you could do what I do and try every chocolate recipe you come across. I guarantee you won’t regret it. When it comes to layer cakes, you really can’t beat this one with coconut caramel. Or perhaps you’d prefer this one, with its layers sandwiched with a subtle pink raspberry buttercream? If you’d rather ganache icing to buttercream, but you still want raspberries, you can’t go wrong with this one. I think that berries and chocolate is a winning combination, but then so is peanut butter and chocolate, as you’ll find in this delectable layer cake. And if your favorite ice cream is mint chocolate chip, look no further than this amazing mint chocolate chip layer cake. For nut lovers, you can’t really go wrong with hazelnuts. This incredibly moist-looking cake pairs warm chocolate hazelnut cake with creamy cold caramel marshmallow ice cream. Of course, when one thinks about hazelnuts thoughts of Nutella are never far behind. The iconic chocolate-hazelnut spread pairs well with all sorts of chocolate desserts, including chocolate cakes. For instance, take this ultimate chocolate and Nutella cake, which its creator calls “the ultimate Nutella layer cake with three fudgy layers of chocolate sponge, whipped Nutella filling, and glossy rich chocolate cake”. Or perhaps you’d prefer these Nutella cheesecakes with salted popcorn crust? They look luscious, and they’re gluten free to boot. Molten lava cakes are another favorite; the ooze of the chocolate as one’s spoon glides through the soft crumb is slightly magical. I remember being served a molten lava cake once that wasn’t molten on the inside, and it was difficult to hide my disappointment. This cake does no such thing though, as you can see from the glorious ooze. And of course, this one isn’t disappointing either. You can just get lost in the moment now as you contemplate that glorious flowing chocolate lava. The Swedes have an endearing custom called fika, which is their version of a coffee break. It means “to have coffee, often accompanied by pastries, cookies or pie” and is definitely something I can see myself getting behind. The most popular fika cake is — you guessed it — Swedish sticky chocolate cake, or Kladdkaka. Here’s a recipe that I use; just make sure you watch the cake carefully during the last few minutes of baking time, as the recipe advises. From Sweden, let’s hop across to Germany, home of the Black Forest. I have a deep love for Black Forest cakes; what’s not to love about soft but dense chocolate cake, liqueur-soaked cherries, and lashings of cream topped with chocolate shavings? Here’s a good recipe for you if you’re planning on making it any time soon. Of course, another perennial favorite is German chocolate cake. It’s a rich chocolate cake that is enhanced by the pecans and the coconut, and it is so good. It’s perfect to pair with a glass of cold milk, to be consumed in front of a roaring fire, with a favorite book to read as you eat your way through one of the best chocolate cakes of all time. I have so much more to say about chocolate cake, but for now I have to stop here. I wish you all a wonderful day of celebration, and I hope you make some chocolate cake now. Or at the very least, have a fair-trade chocolate bar. You deserve it! 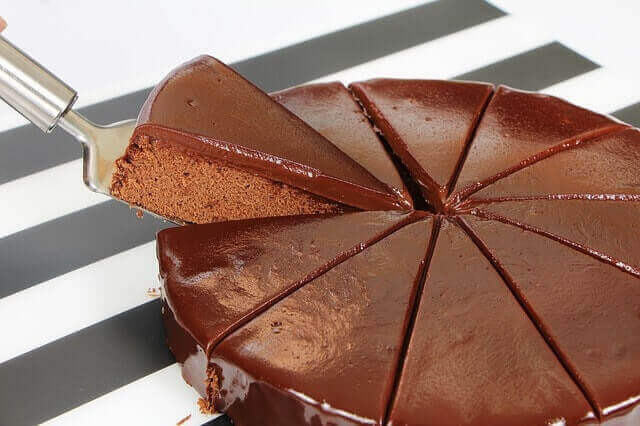 What is your favorite chocolate cake? Do you plan on baking (and eating) a delicious cake for National Chocolate Cake Day? Let us know in the comments below or on Facebook and Twitter.